Is it the Seed or the Plant? Think about it. You need seeds to grow plants, but then you need flowering plants to make fruit that holds the seeds. What came first? The seed or the plant? And how do you grow seedless vegetables and fruit? Companies are actually creating plants that flower, and make seeds, but they aren’t viable. It’s a flowers job to reproduce and create lots of seed to ensure it continues to exist. Think dandelion. Does that make sense? 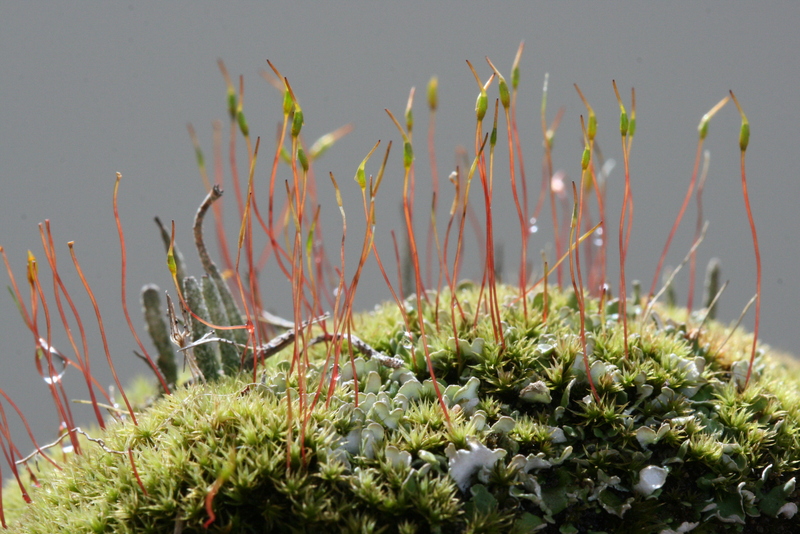 Long, long ago, in the Kingdom of Plantae, there first existed non-vascular (no xylem or phloem to transport water or food or roots) plants called Bryophytes (think mosses and liverworts). They reproduced with the help of water splashing male gametophytes to female gametophytes. Soon evolved Seedless Vascular Plants (plants with xylem and phloem) that reproduced by the production of thousands of spores that drop to the ground at the right time ( brown spots under leaves of ferns). Lastley, plants evolved into Seeded Vascular Plants producing seeds in cones (pine trees) and seeds in fruits of flowering woody and herbaceous plants (trees, shrubs, fruits, vegetables, flowers). Oversimplified, yes, but does it answer the question? Maybe. Moss sp. showing reproductive organs. While you contemplate on this, you need to get a jump on getting your seed catalogs if you haven’t already. Whether you are going to start seeds or not (I will teach you how later, so you might as well order some) the catalogs offer a lot of great cultural information. You can order seed catalogs or download them from the company’s website. While thumbing your way through, pay attention to container or climing tall varieties. They take up less space which is something you need to think about when planning your Urban Farmscapes. Look for seeds and seed companies that are certified organic. Starting with organic seed is the best choice. They should carry the standard logo on their label such as I have here. Also look for heirloom, open pollinated seed. This way you will be able to collect seed to use for next year (I will teach you how to do that later too). Heirlooms are old fashioned varieties that pollinate freely and have been collected and saved over time. These would be the plants our grandparents and great grandparents grew. If you see a hybrid, sometimes called an F1 Hybrid, this means it is a cross between two or more other varieties. In flowers for example, if you cross a white petunia with a purple petunia, you may get striped white and purple petunias or lavender colored petunias. Is this bad? Nope. People have been creating hybrids throughout history trying to improve something about them. Tomatoes have been bred to last longer on the grocery store shelves, thus sacrificing flavor. Who wants a tomato that doesn’t taste good, but can sit on a shelf for a long time? Can you get organic F1 hybrid seed? Yes. But you won’t want to collect hybrid seed because the seed you may get could be the original variety that was crossed to get the hybrid. Make sense? Again, I am oversimplifying while trying to explain the world of plant genetics and seeds. Send me a question or comment if you want to discuss further. I have become obsessed with growing heirloom varieties and collecting seed, but still need (well, want, maybe not need) seed each year. Here are a few of my favorite seed companies. Johnny’s Selected Seeds offers a large selection of organic and heirloom vegetable, herb, and flower seeds as well as fruit plants. They also carry small farm and gardening supplies,along with tools designed by Eliot Coleman. Great quality and service in business since 1973. The employee owned company is located in Maine. The best resource I have found so far for cultural information. You will save this catalog and use as a reference! Awesome online resources. In my garden I will be growing many peppers that are recommended by Johnny’s for containers, along with many other yummy things. Johnny’s has been my favorite seed source for as long as I have been gardening. Baker Creek Heirloom Seed Co. The life forces behind this fourteen year old company are Jere and Emilee Gettle who produce only heirloom varieties. You should buy their book and to learn more about heirlooms and their whole story. 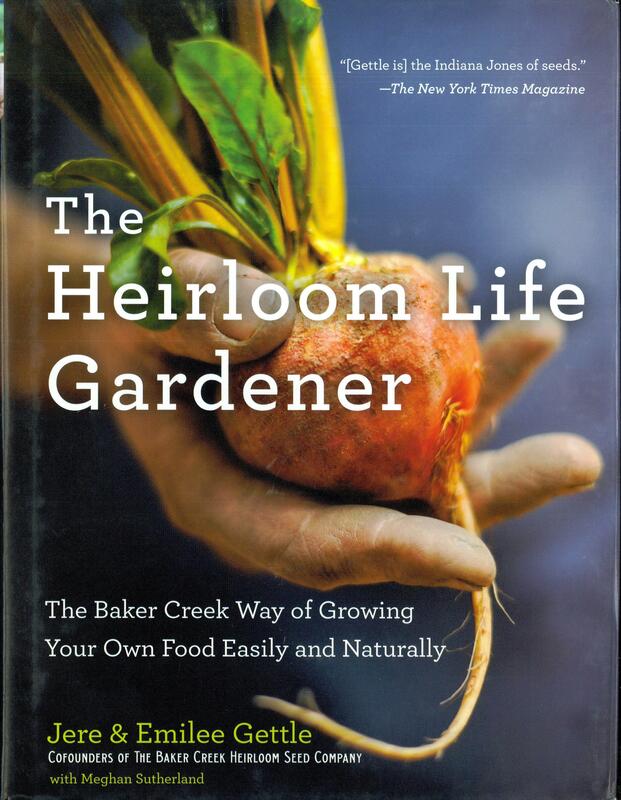 The Heirloom Life Gardener by Jere & Emilee Gettle with Meghan Sutherland is available on their website and other book buying venues. Not only is it a story about Baker Creek and the importance of growing heirloom varieties, it has an A to Z Growing Guide for their favorite fifty crops that include the history and uses of the plant, growing tips, pests and diseases, seed saving and preparing it to eat. AWESOME! In my garden this year I am going to grow their Top 10 Favorite Container Plants that is discussed in their book in chapter 7 titled, “City Farmer”. Buy the book. You won’t be disappointed. While I’m on the subject of heirloom and open pollinated seeds, check out Seed Savers Exchange. I would definitely have to agree with them as being the nation’s premier seed saving organization. Located in Decorah, Iowa since 1975, they are a seed saving non-profit member organization collecting and selling seed to help fund their preservation efforts. I have always wanted to visit their Heritage Farm headquarters or attend one of their special events. If you don’t want to start your own seed, then you could opt to buy transplants from them. They grow and sell several heirloom pepper transplants as well as heirloom tomato varieties like Cherokee Purple and Hungarian Heart. These won’t be at any garden center I know of. You don’t have to be a member to order from their catalog, but if you do become a member, you will receive 10% off of your order! Seeds of Change. Located in New Mexico, probably one of the first organic seed companies in business since 1989. They have taken the Safe Seed Pledge and donate 1% of their net sales to advance the efforts of sustainable agriculture across the world. A very philanthropic company. They have identified vegetable varieties for “Space Challenged Gardening” which is what most of us Urban Farmscapers are dealing with. Peaceful Valley Farm Supply. Based in California. Organic seeds, plants, tools and fun gardening stuff. You can even get 10 Fruit Trees delivered for $199 ! That is, if you have room. I planted four varieties of garlic and one type of shallot this past autumn that I ordered as a Garlic Combo Pack. If you want to grow garlic, keep in mind that you plant it in the autumn. Order your seeds soon to make sure you get the variety you want. Soon I will guide you through successful seed starting indoors!